As Armistice Day, 11 November already holds a special place in the psyche, but for British jazz fans it has a little extra significance. On that date in November 2017, pianist Terry Collie phoned a group of his musical associates with the idea that they should combine to present a tribute to the music of the late and much-missed Michael Garrick MBE. Each had close links with Garrick: Gabriel Garrick (trumpet, flugelhorn) as a son as well as a fellow musician, Nette Robinson (voice), Tony Woods (reeds), Matt Ridley (bass) and Chris Nickolls (drums) as members of Garrick’s various ensembles. The significance of the date didn’t become obvious until they gathered for rehearsal a few days before the concert. Michael Garrick passed away on 11 November 2011 aged 78. This moment of serendipity added a magical quality to an evening in which the spirit of Michael Garrick filled the auditorium of the Riverside Arts Centre. His portrait, the work of Nette Robinson, held place of honour in the centre of the stage and he looked out approvingly as the proceedings unfolded. For this was no mere tribute band. Gabriel Garrick, custodian of his father’s archive, had dusted off a collection of original charts, some dating back to the 1960s, which opened a window to this glorious musical legacy. Nickoll’s neat drum introduction to Promises set the evening in motion with Robinson’s vocal taking up the ‘will-he, won’t-he’ frustrations of personal relationships. She captured the enigmatic sentiments and humour of the song to perfection. Shining Light, recorded by the Garrick Lyric Ensemble in 2010 in a tribute to Bill Evans, is a beautiful piece and a more than worthy choice given the nature of the occasion. Robinson’s crystal clear diction expressed our deepest feelings for the loss of a loved one. 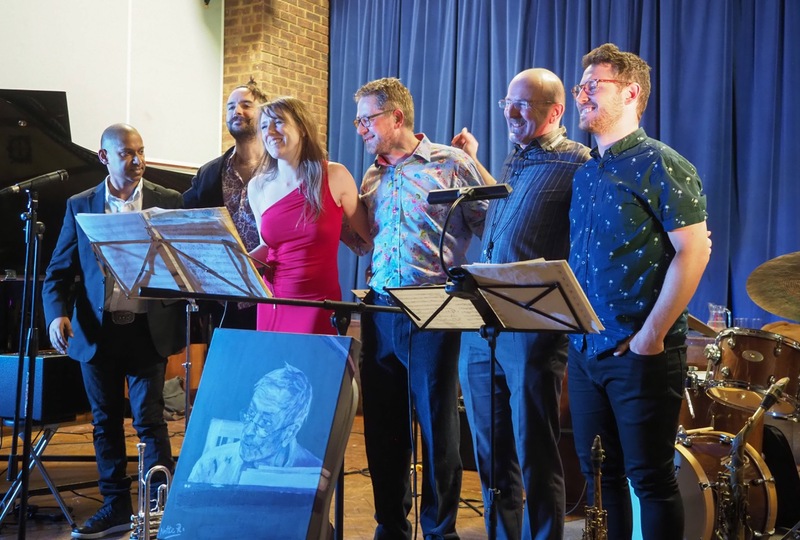 All Is Forgiven, which began life in the mid-1980s for Garrick’s then sextet, Fly-by-Nite, set the room alight with its ferocious swing and intriguing harmonies. Gabriel Garrick’s declamatory trumpet and Woods’ wailing tenor combined to produce a wonderfully fat ensemble sound, the launching pad for their scorching solos. Collie’s Cuban-styled solo raised the temperature with the help of Ridley’s gorgeous bass lines. Nickolls kept the ‘pots boiling’. Robinson returned for Swallows on the Water, a number which holds a special place in her heart as the first she sang with Michael Garrick. Black Marigolds, an enduring Garrick classic and first recorded as a solo piece on harpsichord in 1966, brought the first half to a close. Based on a Sanskrit poem, its hypnotic, raga-like patterns held one firmly in their grip as they spelled out a story of forbidden love and ultimate despair. The second half opened with Opus 390, setting heads swaying and toes tapping to its joyous samba rhythm. No one (including, I suspect, Gabriel Garrick himself) would call him a singer, and yet his vocal contribution to The Heart Is A Lotus fitted perfectly. Webster’s Mood, performed here with Robinson as both vocalist and additional instrumental voice in the ensemble, was perhaps the most notable of many Jazz Portraits composed by Michael Garrick. Woods and Gabriel Garrick respectively expressed the tenderness and irascibility of tenor saxophone legend Ben Webster. Galilee first took shape as an accompaniment to Jeremy Robson’s poem Sketches of Israel. Lending itself to a Latin American treatment it became a vehicle for the trumpet of Shake Keane, now a vocalese role taken by Nette Robinson. It sparkled with delight. Aurian Wood brought the concert to a close with five minutes or so of pure magic, holding the audience spellbound long after the final notes had faded. No one could have predicted that within 24 hours the song would take on a special significance. Joan Campbell, the ‘Lady of the Aurian Wood’, who inspired the tune, passed away on Monday 5 February. She would have taken great delight in the concert and to see that the spirit of Michael Garrick continues to shine so brightly. Thanks to Terry Collie and Janet McCunn, and congratulations to them on marking-up the second anniversary of Jazz at Riverside Arts Centre. Long may it prosper. Trevor Bannister assisted Michael Garrick as co-author of Dusk Fire: Jazz In English Hands, an autobiography.